increased image clarity, faster frame rates, or more. 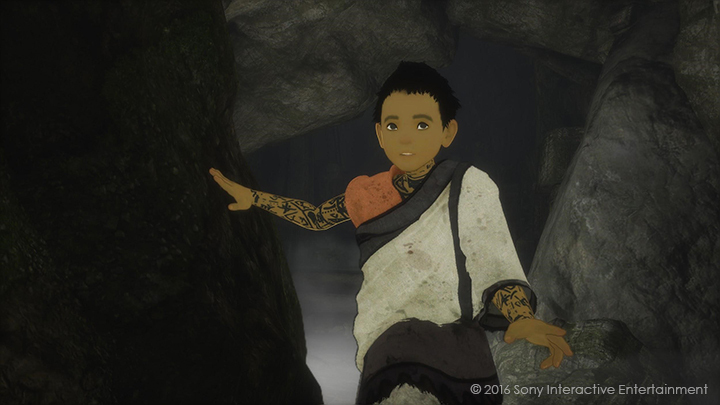 This is a continuation of the special symposium on The Last Guardian, to commemorate its grand prize win in the entertainment section of the 21st Japan Media Arts Festival. We will continue to answer a variety of questions and inquiries. For this fourth part, we will start with some questions about the animation! Just like last time, this conversation also contains spoilers. So read at your own risk or come back after you've finished the game! Game designer, game director. Best-known works include Ico, Shadow of the Colossus, and The Last Guardian. Lead animator of The Last Guardian. Also worked on Shadow of the Colossus as an animator. Narrative designer on The Last Guardian. Also active as a Vocaloid producer under the name Captain Mirai. 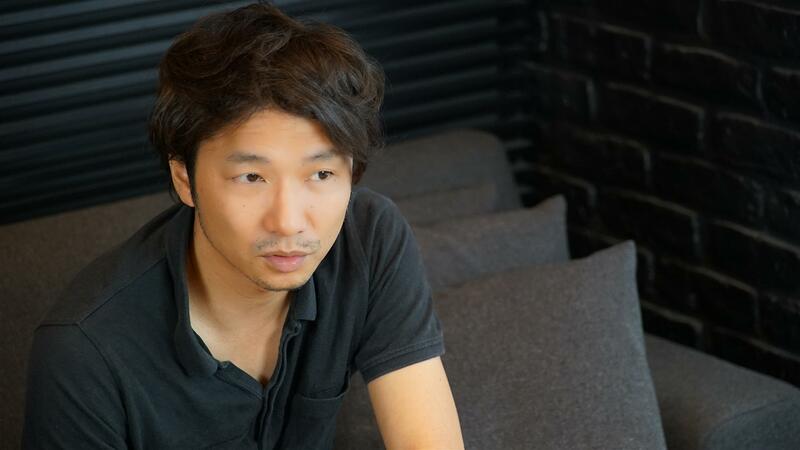 This studio was formed by bringing together lead staff involved in the development of Ico and Shadow of the Colossus, beginning with Fumito Ueda. Under his guidance, it was responsible for the entire creative aspect of The Last Guardian. All of the creative direction, including game design, animation, level design, modeling, etc., was completed by a small number of elite staff. ―I'd like to move on and talk about the animation since there were many questions about that as well. To summarize, the main question was: "How did you create so much amazing animation?" Many people think you used motion capture. ―It's true, there aren’t any animals like Trico in the real world, so it must have been difficult to create the movements by hand without any kind of image in mind as a starting point. Ueda The limits of the design were determined by game design and hardware, but I think most of the staff suggested imagining cat-like movements. Cats are loved throughout the world, and even if they don't always listen to what you say, you probably always end up forgiving them. (laughs) And they like high places more than dogs, so they're the best reference to use for animals that move around in high-up places. Tanaka I've never had a pet cat, so I just watched a lot of videos. But if you use a cat's movements without changing them, there's no sense of scale. I was in charge of animation for the Colossi in Shadow of the Colossus, and the Colossi were characters that were stiff, dull and did not show emotion, so it was a completely different thing from animating Trico. ―Although they have their large size in common, a stiff Colossus and a flexible animal... are complete opposites, in a way. Tanaka That's why we looked at tigers to help give a sense of scale. We compared cats and tigers, while imagining an even more large-scale creature. Of course, we also included movements from many other animals. ―So you incorporated the movements of various animals in order to give a sense of life. After finishing everything, is there any animation you are particularly attached to? Ueda I liked the movement in one of the earliest trailers, for example, when Trico is perched on top of a narrow column and nods its head toward the boy like it wants something. I don't know what that kind of behavior means in an animal, but it strangely reminded me of something my dog would do once in a while. So that's why I had Tanaka-kun use it as material to create that animation. 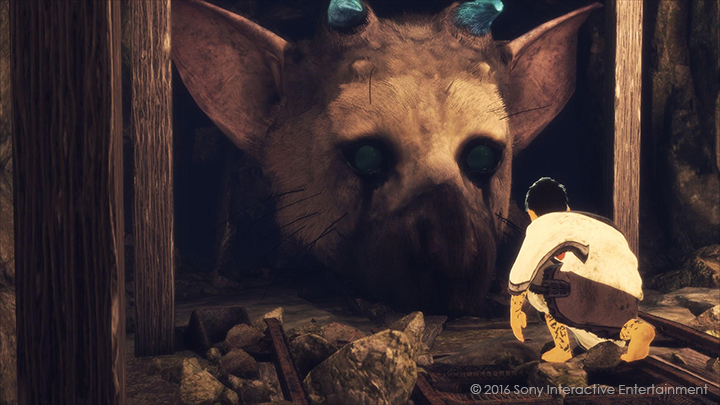 -Ah yes, that early Trico scene made a big impression. The game’s cover has that image on it too. 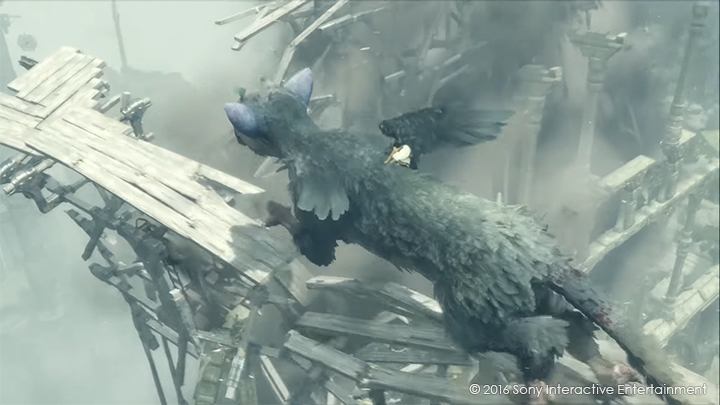 In that scene, we animated Trico checking several times to make sure the boy was still on its tail. I was happy that many people noticed that. 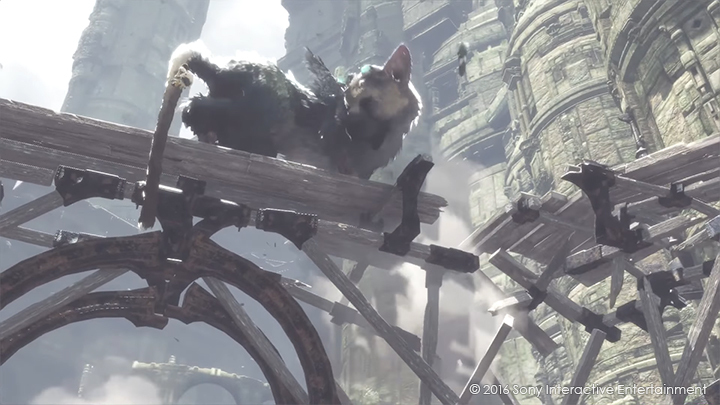 Ueda And this is a bit different from attachment, but there's the animation where Trico sticks its head in too far, gets stuck and can't move on. When I first thought of it, I thought it would work well but in the middle of such a long project, I stopped thinking much about it. I only found out recently that there was a big reaction to that movement on SNS. That surprised me a little because we completely stopped feeling the novelty of that part. ―I came in for the second half of the project, but the first time I saw that movement, it made me chuckle. It was a little silly but cute. Actually the players also liked it. Earlier, Tanaka-san was saying that the animation for Trico was basically done by hand, but there were some parts that couldn't be handled that way, right? Tanaka To speak in terms of animation technology, we challenged ourselves with procedural animation this time. Procedural animation is the process of producing motions in real-time via calculations. Actually, in Shadow of the Colossus, we tried this with some characters, but now with The Last Guardian, improvements in the calculation ability of the hardware has made more sophisticated expressions possible. I think it was a lot of tough work for the staff because they had to have knowledge of both programming and animation. ―So it means producing animation in real-time, but is there a place which would be easy to understand the concept of procedural animation? Tanaka For example, if Trico is climbing a slope, its feet are at different levels, but we might only really have animation data ready for flat terrain. Trico will automatically judge the terrain itself and decide where to place its feet and adjust its body position. Then there's also Trico's head motion. Looking over its shoulder naturally, catching a barrel thrown at it... those kinds of actions are also characteristic of procedural animation. 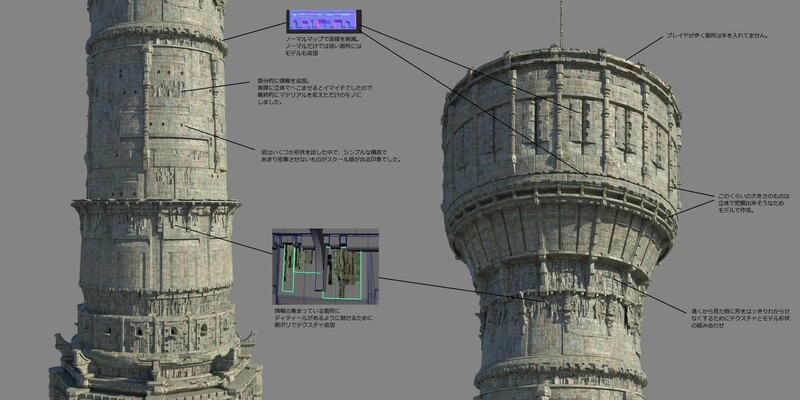 *You can see some of The Last Guardian technical documents, including procedural animation here. Ueda But actually, some of the ready-made motions that could be played back without much trouble had a bigger impact on players than some of the parts that we worked hard to implement with procedural animation. I mean, it was surprising, or rather gave me mixed feelings... For example, the motion of swimming. That part was different from the ones that were difficult as far as "control". Instead, it was one of the simpler parts to implement. The motion created beforehand just had to be played back at the position the animator chose. Tanaka That's right. With procedural animation it's quite difficult to produce a natural gaze or powerful pose. ―It's true, when creating movements, the subtle parts are actually harder than the flashy parts. But it's hard to get that across, isn't it? Ueda Still, with procedural animation, since the naturalness of a casual movement or the sturdiness of a motion have a firm foundation, those special movements at important points are probably more successful. Tanaka Also, the gathering of huge animals walking naturally in a narrow space makes the environment a special place and not “just” an environment. Ueda Yes, huge animals in a wide-open space don't convey much of a huge feeling. ―A part I liked was when the boy gets close to a wall and put his hand on it. That kind of procedural animation is casual, but I think it's extremely effective. It's certainly not flashy, but it supports the realism. Ueda In the end, the game world is a papier-mâché world made of polygons, and the extent to which it is felt to be real can only be produced by the reaction to characters and objects. It's pantomime theory. Though of course, sound effects are important too. ―I'm sure there were also cases where you wanted to put something in but couldn't because of technological or time issues, or there were changes; could we hear something about that? Ueda Maybe the physical animation of the armor for enemy characters. By taking the procedural animation we talked about earlier a step further, we tried to make it automatically consider the coefficient of friction with the ground. Of course, it was just an imperfect version. On top of that, with the contact between Trico and the boy, we referenced their centers of gravity and made them have motion transitions that would let them dynamically move their feet so as not to fall down. Those kinds of things gave us quite a challenge at times, especially in the PS3 era. Unfortunately, it didn't seem like we could guarantee the stability of the product on schedule, so that was one component we sadly had to lose. ―There was also the idea of pushing away soldiers and making them trip on obstacles. 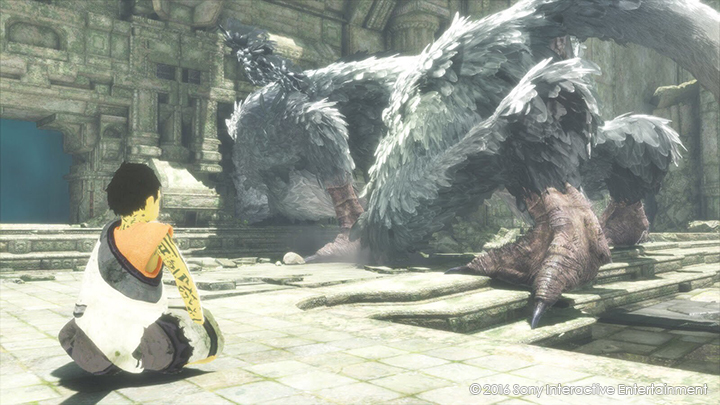 As far as changes in methods, the way to give instructions to Trico, for example, went back and forth during the time I was there. I remember that at first, pressing a button would change it to first-person view, and then you could choose to give instructions. Tanaka That's right, in the game design, the most impressive change was the method of giving instructions. I feel like once the design of that part was set to how it is now, it determined the direction of the game. Talking about game design, I have the impression that the game was really made without many changes to the initial concept except for that part. Ueda And grabbing via the R1 button. Until quite late in the second half of production, you could only grab while pressing the R1 button, like in Shadow of the Colossus. Particularly after the development environment changed to the PS4, the control behavior of the boy on Trico was unstable, and at one point, some genDESIGN staff thought that doing it that way might make it difficult to get the control ability for the product up to the ideal level. So there was that as well, and in order to stabilize the controls, we decided to make the change. Since in The Last Guardian there was no strength meter for the boy, unlike Shadow of the Colossus, and the players rarely chose not to grab, there was the aspect of interface optimization. ―That was really a last-minute change, wasn't it? We were used to grabbing with the R1 button, so at first it was confusing. Ueda You can really see how last-minute of a choice it was because at E3, six months before release, we had a limited playable version of the game for the media people to try out, and at that time we were still using the R1 grab method. Tanaka We were debating about it really up to the last minute. Since Shadow of the Colossus used the R1 button for grabbing, changing it might upset some users, but the controls were easier overall as a result. Ueda Right, and we also wanted people who hadn't played ICO or Shadow of the Colossus to be able to play this easily. Ueda Also, as far as other components we weren't able to put in, this is a detail of the video production, but we actually wanted to do a time-lapse after the ending. We planned to show a movie of Trico returning to the village, and after spitting out both the boy and the mirror, the forgotten mirror is slowly covered in earth, then slowly revealed again, in a time-lapse of several decades passing, transitioning into the credits... but we couldn't put it in because of the schedule. Ueda We planned to implement the treasure component up until the last minute too, but sadly we cut it in order to polish other areas instead. ―We planned to implement the treasure component up until the last minute too, but sadly we cut it in order to polish other areas instead. Ueda Right, having Trico swallow various things and spit out bonus items also foreshadowed Trico's ability to swallow and spit out the boy and the mirror. ...Another component we really wanted to put in was the concept of implementing updates to Trico's AI through the network. ―What kind of idea was that? I don't remember. Ueda For example, after the game's release, we would aggregate the play logs of all the players, and if there were stages with low clear rates, we would make Trico give more hints, or hold the boy in its mouth and guide him until he finds the right answer; by updating the AI according to actual play statistics, we would be able to adjust the balance in a natural way. And we would also be able to adjust Trico's personality to match the user's play style and so on; there are various other things we wanted to do. Because Trico's AI plays such a central role in the game's concept, there would have been a lot of possibilities if we could have updated the AI, so it was really unfortunate that we couldn't implement that. One idea that we didn't use in the end was feeding Trico jars that were buried in the ground, and having it spit out treasure items. ―I see, so that means Trico would be able to grow and change according to the overall behavior of users. It fits the game concept, and I can’t help thinking about how it would be if it had been implemented... While there are unfortunately some components that we were unable to implement and had to cut, there are others on the other hand that we were just able to put in. Ueda Yes, like those cases when we could anticipate the effectiveness being greater than the implementation cost. ―Ueda-san actually spent several hours making it and then just smiled and said, "Oh, I made this." ―It probably wouldn't have been very difficult to implement a menu or something on the pause screen where you could see a hint log for example. Ueda My idea came from thinking about whether there was a more natural way to convey it to the player. And I was thinking that I wanted to put in a pose or motion that would be interesting when the player takes a snapshot of the game screen. Some characters have a special idling motion like dozing off that they do when the player isn't using any controls, but I thought it would be new and fun to be able to do that through the player's random control. ―It's beautiful when you can sit and meditate and look out over the scenery... The game lets you enjoy that kind of sightseeing as well. There are many stages where you can almost feel the wind too. ―This is somewhat related to the previous topic, but it must have been pretty difficult to create background environments so that it would be beautiful no matter where you look. Can you say anything about how difficult or troublesome that was? Tanaka We were very particular about representing the wind. It's common to just give the wind a simple noise and be done with it, but I suggested and had them implement a realistic wind algorithm, so that it would feel more natural. Tanaka When you ask a programmer to design the algorithm itself, there are repeated confirmations and adjustments until you reach a satisfactory end result. That takes time and can get you distracted from what you originally wanted to do, so sometimes I design the algorithm myself here when I can, and ask them to implement it using the calculations. We try to convey non ambiguous ideas and make sure that the final implementation is as close as possible to the design of algorithm. Ueda That’s right. If the design and implementation are too far away from each others, we end up having the same issue as “concept art is great but the actual game doesn’t look anything like it.” At genDESIGN, we try to avoid this issue and get the final result as close as possible to the original idea, from concept art to character design, regardless of the algorithm design. ―I see. When you can do the algorithm design yourself, you can be very flexible. What kind of suggestions were there specifically? Tanaka Even though we worked on the movement of objects, it didn't convey the feeling of wind very well, so we separated the wind side and the affected object side (feathers, plants, etc.) and approached it from both angles. For example, you may have seen how the wind passes like a wave over a rural landscape, so in order to reproduce that, we expressed the wind using a method as though there were pseudo-waves going through empty space. As far as the affected objects, doing it in a simple way means they just fall over and lie flat, so I made it so that the effect can be adjusted according to the wind direction and angles of the object, and some things can be greatly affected by the strength of the wind while others deflect it. ―That is quite complex... or should I say, particular. So the way it worked was that you gave them that kind of algorithm and had them implement it. Tanaka I'm sure it was difficult to implement, but I was able to gather ideas from others at genDESIGN before giving it to them, so that was better than going back and forth again and again. ―This is a world where nature that lets you feel the wind and decaying manmade structures coexist. It must have been a huge workload; how did you approach the project? Ueda We quickly adopted an approach of using parts and layout for the background. Although that workflow is quite normal nowadays. ―So, does that mean there is one rock and one slab of wood, and these small parts are combined to create large-scale sceneries? Ueda Right. 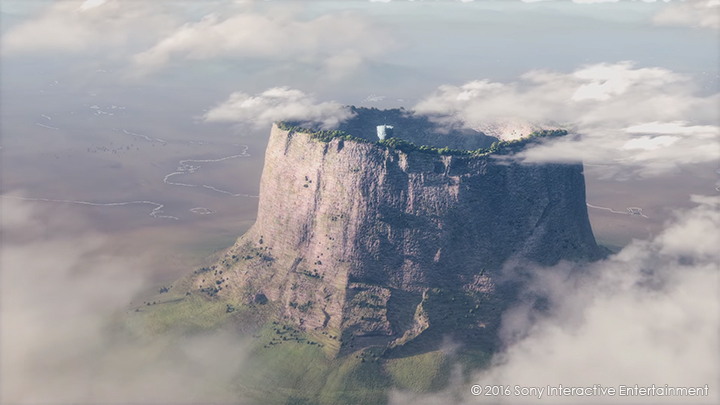 Thanks to this workflow, we could create a realistic background density, and quickly handle changes to level design. Tanaka genDESIGN designed the important parts, and we had JAPAN Studio expand on them and do the layout. We also outsourced some of the parts design to x10studio. We're thankful for that. We also did the art direction, including writing, at genDESIGN and I think that heightened the quality and gave the whole thing a sense of unity. ―I see. So by using this block-building method for the environment creation, you could condense the density and work time. Tanaka Also, if you simply make a layout, it will look neat and orderly no matter what you do. So Ueda-san suggested processing it to make it all distorted in order to represent decline over time, and we had JAPAN Studio implement that. It was already implemented during the PS3 era but it was arranged too neatly, so we intentionally distorted it. They were able to get it done in the end by working consistently on all the fine adjustments. Ueda It's not simply distorting it; for example, if we take a path, there aren’t really any changes to the edges of the path, but the middle would be slightly worn down by the feet of people coming and going. Those kinds of manual adjustments are relatively simple to do using tools. So are ceilings, walls and pillars. These algorithms are not that complicated, so if possible, we wanted to have them be calculated automatically. ―It's really convenient if you can do that much automatically. It's interesting to be able to control how deteriorated a building looks using a slider. I knew that the game background was created using that kind of approach, but many of the cutscenes were made as unique, weren't they? Ueda Well, there weren't that many unique parts. As for cutscenes, we actually fully created the scenery around Trico's nest that you can see from the clifftop extending to the horizon. But in the last cutscene where Trico takes off, there was an error with the fog settings so you couldn't see anything... It was a shame to waste the work, so I want to post a picture of it. Panorama of Ukaiya. If you look closely, you can see that there is a river surrounding it. We'll end the fourth session here. Next time will be the end at last. 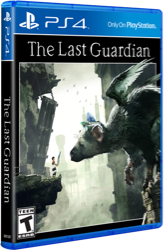 We'll look back on the discussion and talk about The Last Guardian in general. Please wait a bit longer for the next update!